Joe’s Live Radio Interview on Who’s Next? Joe Hawranek was interviewed on Jan 14, 2016 by Stu Taylor about his Book, Who’s Next? Stu Taylor has national shows that focus on the business communities of the major metropolitan areas in the country. This interview was heard by an audience of about 30,000 and was broadcast twice. In the interview, Joe did not have time to complete the litany of items probably discussed at Jekyll Island by influential banking conspirators that created the Federal Reserve Act of 1913. The missing element was Education. JP Morgan did not like the American education system. He wanted,“Workers not Thinkers!” The educational system at the time was based on McGuffey’s Readers. They were used from 1860 to 1939 and had Christian beliefs of the 10 Commandments built into the stories. They also used Greek Logic and forced the students to think. For instance, a 7th grade assignment could be “Here is The Sermon on the Mount” and the students would be asked to analyze it. They were also asked to memorize the 10 Commandments, the Gettysburg Address and the Preamble to the Constitution. 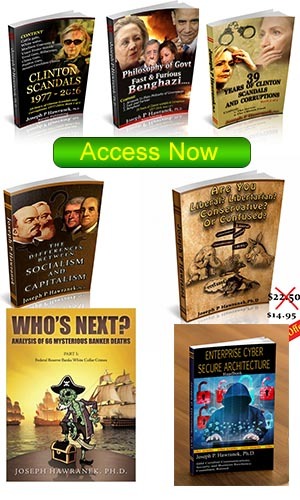 The books are still a good read today – informative and interesting. Also, they make you think. JP Morgan had “Skull and Bones” at Yale recommend a candidate to change education in America – – – John Dewey. The Skull and Bones was founded as an Illuminati branch in the 1832, 76 years after the Secret Illuminati Society was founded. It exists today. To make John Dewey successful and influential, JP Morgan funded Columbia University to take on John Dewey. There were only 20 professors at the time. Dewey wrote his first book there and it became the founding document for what became the Progressive movement. Then, JP Morgan endowed University of Chicago to establish an education school where John Dewey was made Dean. He used his book as the main theme for his new school. Dewey did not believe in God and attacked McGuffey’s readers. He was successful in removing the Readers from the American education system in 1939. This Education element was left out due to time. Let us now go to the interview. Click Here for the 10 minute Interview discussing Who’s Next?